HOLIDAY COMEDY WITH MUSIC. This is one Dickens of a tale! This modern-day redneck Scrooge lives in a single-wide trailer where he counts his money from his bizness running some stalls in a Florida flea market. It’s the hottest Christmas Eve in the hist’ry o’ Florid-ee and Scrooge tells his employees, Bobby “Bowlegs” Cratchit and Honeydew, that they will have to work on Christmas. Later that evening, Scrooge is visited by the Ghost of Christmas Past who looks a lot like a redneck Santa Claus; the Ghost of Christmas Present who resembles a redneck Christmas tree; and the Ghost of Christmas Future…well, he may be the black sheet of the family! Then a group of zombies led by the Ghost of Jacob Marley arrive and Scrooge realizes that the only way to git ‘em back to their dingy-dang graves is to give ‘em some Christmas presents. 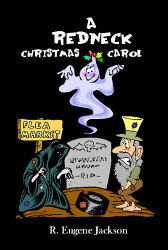 Fed up with bein’ visited by crazy redneck ghostez and knowin’ the Crachits only jist got taters fer Christmas dinner, Scrooge invites his employees and the whole Cratchit family to the flea market to celebrate Christmas with a dinner of seafood gumbo and few redneck Christmas carols! During his career of teaching drama on the university level, R. Eugene Jackson has written more than 100 plays and musicals (books and lyrics), and has close to 80 publications. Jackson lives and writes in Mobile, AL, and spends part of his time in New Orleans.